More info:Volunteers can join for a minimum of 4 weeks, and then increase it by increments of of 2 weeks up to a maximum of 3 months. So you can join us on North Island for 4 weeks, 6 weeks, 8 weeks, 10 weeks or 12 weeks. This amazing conservation opportunity in the Seychelles is open to volunteers and eco-tourists aged from 18 to 70 who are willing and able to spend a minimum of four weeks monitoring and observing endangered animals in their natural environment. Not only will you be helping to make a real difference to the lives of turtles, terrapins and tortoises but you’ll also be assisting dedicated conversation and research staff living and working on North Island. Our aim is to monitor endangered species, restore the islands' ecosystems and simply conserve the underwater world of the Seychelles for many more years to come. Only with the help of volunteers can we achieve our goals and as we’re the proud winners of the 2017 World Legacy Award for Restoring the Natural World, you can rest assured that you’re also in safe hands. Staying on North Island is an absolute pleasure and places you right at the heart of one of the world’s most spectacular island collections. Beautiful sandy beaches, rugged hillsides and clear blue ocean waves will provide the backdrop to your month in paradise. As you’ll be staying at a shared house with other volunteers you’ll have plenty of opportunities to make new friends as well as being based close to the North Island conservation staff village. Although you’ll be participating in conservation tasks six days a week there’s just so much to take in that it won’t feel like any job that you’ve ever experienced before. After clocking off time you’ll be able to socialise, swim, snorkel or get sporty with SUP boards, surfboards and sea kayaks all available to use from four o’ clock. Fridays are free to rest and play with lots of islands easily accessible by boat. The working day ends at around 4pm, though there are breaks during midday heat. Although no experience is necessary we do request volunteers are as fit as they can be as you’ll often be required to walk long distances on a daily basis mostly along the beaches. Also, please be prepared for some very hot and humid conditions – totally tropical. Having a sharp mind and the patience and understanding to be able to listen to instructions is crucial. Often you’ll be left to work on your own after a short lesson so make sure this is something you feel comfortable doing before you sign up. From marking, monitoring and counting endangered species to underwater photography, foreign flora control and daily beach patrols, this conservation holiday in the Seychelles is just as much about developing yourself as it is about helping to preserve the natural world. Pack light but include a quick dry towel, walking boots and eco-friendly mozzie protection. Accommodation, training, equipment, airport transfers, all volunteer activities and staff uniform. When North Island was abandoned as a plantation in the 1970’s following the collapse of the coconut industry, many unwanted and intrusive species of flora and fauna remained behind such as coconuts, casuarina, cows, rats, pigs, Indian Mynah birds, cats, barn owls and an especially invasive weed called lantana. After the alarm bell had been sounded by prominent ecologists, the challenge was undertaken of not only reversing the Island’s decline but of taking the long road towards the restoration of the Island to its former glory. A cornerstone of this bold initiative has been the “Noah’s Ark” concept by which tortoises and certain species of birds are gradually being re-introduced to the Island along with such indigenous trees as takamama, badamier and the legendary coco-de-mer palm. The island also emphasises on keeping the environment clean by not letting waste water contaminate the environment. The on-going process of conservation is at the very heart of North Island’s philosophy and of this volunteer trip. North Island encourages Wildlife Groups of the Seychelles (including schools and universities) to visit North Island periodically. A full programme is put together to ensure that learners and students are able to experience the wonders of the island, whilst at the same time learn about the importance of island and ocean conservation and its relevance to their lives. The activities we do with the Wildlife groups include tree planting and various conservation presentations and an Island tour where the history of the island is explained together with the Noah’s Ark program. Our eco-tourists are also encouraged to explore the other islands of the Seychelles and support local tourism when they can. There are multiple ferries to Praslin and La Digue over the weekends, allowing volunteers and eco-tourists to take day trips to the islands during their down time. The Vallee de Mai, a world heritage site, is located on Praslin and features the beautiful and famous Coco de Mer palm. Every second, from getting on the boat to going to leaving, everyday was marked with memories. Snorkeling and beach patrol were my favourites along with spending time with Elliott, one of the environmental team, he was a very knowledgeable man and taught me so much, however, planting, data input, tortoise GPS tracking, driving the buggy to name a few of the other jobs i did were equally fun and rewarding. and holds so much knowledge. Always have a camera with you. Take plenty of bug spray and once you pack your case, open it back up and take out half of it, camera, good shoes for climbing the trails, flip flops are all you really need, your live in staff uniform, you receive a list of what they advise and if just going to island that is all you need. and get to see so much wildlife. I Believe the island is about to receive an award for all there hard work. accommodating, happy and helpful. I could talk for hours about all my experiences and still have stories to tell. Amazing, you will never experience anything like this anywhere else, clean air, clear night skies filled with stars, standing on a beach without another person, sun rises and sunsets, living your own wildlife documentary and being surrounded with kind honest people. Thank you Responsible Travel for finding this project, its what dreams are made of. Beach walking ,recording locations of nests. seeing the hatch-lings making for the sea. It is another world where you can totally relax leaving your worries behind you and putting things in perspective. Enjoy the snorkeling and the giant tortoise learning their behaviour. Taking part in a project which is designed to encourage the survival and thriftiness of some of the threatened species in the Seychelles. Removing some of the invasive vegetation and species as required. Be happy and confident enough to be able to enjoy the moments when you are alone with nature. everything is provided so travel light .Free laundry, three meals a day, your own wooden hut in the jungle village with own bathroom ,shower and fan, the clothes you wear etc. Arrive early or stay on late if you want to see the rest of the Seychelles. leaving and returning to the island during your months stay is rather difficult because of ferry times.Be prepared to mix in with the 150 permanent residents and make friends if you want to really get the most from your holiday. 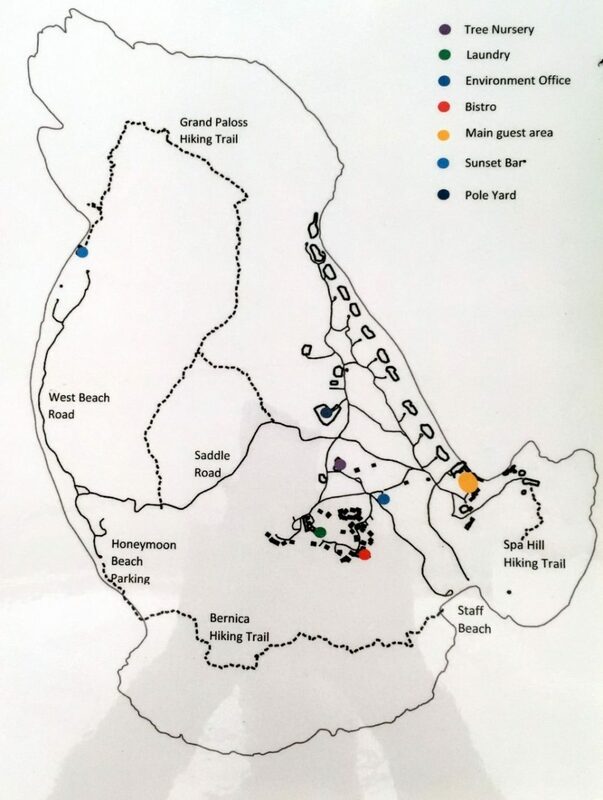 development of the original habitat of the Seychelles which in turn encourages managed tourism bringing money to the islands in support off the local population.the idea is to make environmental impact a positive input. One or two anomolies do occur but it is the money from the tourism that funds the development of the environment on as island like this -so just remember that. A unique experience from which you gain as much as you put in. I loved it.THERE IS NO AGE LIMIT .Anyone can earn and enjoy the fullfilment.